Toasty is the most subservient of the cat clan. She will go out of her way to please her human companions. She is the most tolerant of human interaction, but the least tolerant of canine interference. She has the largest appetite of all the cats, taking in most of her food nocturnally. Her talent is the jumping twisting cat headbutt for which she applies with force and conviction melting the hearts of her targets. Emmy is one of the strangest cats, even by cat standards. She enjoys snow, water, and has an affinity for people food. She will bravely invade your eating space, and do anything to get a taste of milk, risking a shove off the kitchen table. She is by far the alpha female of her clan, defending her space with furious rabbit kicks, and lightning quick swats. She is mostly seen around the matriarch of the Clemente family Elizabeth climbing on her unapologetically without regard to personal space or schedule. She is widely considered the closest link between the human and feline world with her behaviors, and mannerisms. If a such thing as an Ash Calico existed anywhere other than in my head, Winnie would be it. She spends most of her day just out of reach and barely in sight, often judging those around her, and with good cause. Just a little backstory: Winnie was found with her sister, Abby, in an abandoned apartment in a high rise in Chicago. A flier was put up advertising that they needed a home, posted by someone with the lack of taste to name her Serendipity. While she sports the outward demeanor of a dark, brooding loner, Winnie is the premiere nester (seen above) in trusted circles. Winnie's primary interest is in stepping out on the town at every opportunity. Winnie is primarily known for her ultrasonic meow. The longest recorded Winnie meow last 7 seconds. There were no survivors. The braver and brattier (only slightly) of the sisters, Abby carries out the conventional duties of a cat (confidence, curiosity and belly-rub traps) with an unmatched intensity and probably at first glance is considered the most traditional of all CXNX cats. While quick with the comic relief, Abby, known by others as Static or Cheese(cake), is no dummy. Abby has shown a nearly devout interest in 1960's art films, spending 3-5 minute long stretches in front of the screen (her favorites are Pitfall and Persona, no joke...) and to exhibit that amount of attention span is certainly a noteworthy feat for a cat. Her real-life super powers include super-agility and super-conductivity. 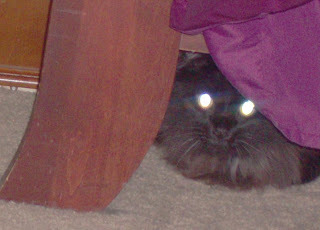 Miyagi runs his business from under the dark confines of the bed. He is widely considered the most handsome of the cat clan, but keeps his gift selfishly to himself. He was rescued through the A.N.N.A. program through Erie, PA to which he was possibly a survival of abuse, and/or fire, as his whiskers and coat were singed when he got him. Although notoriously aloof, his abandons his arrogant ways for cat treats, upon seeing the small foil pouch he will sing and perform basic level cat headbutts to earn his reward. Miyagi is equipped with lazer eyes to defend his under bed kingdom from all intruders, his only natural defense since his previous owners had all four of his paws declawed. Bailey is the clown prince of the cat clan with a sense of adventure unmatched by the rest of the group. He will take residence inside of the family room couch to pass the time, and gently attack humans through the cracks of the cushions. Unfazed by canine interference, Bailey is the best combatant amongst the whole clan. He has had clean victories over all opponents faced without dispute. Bailey's soft spot is faucet water, or any new water source to him. He has been known to be very vocal in his fresh water demands, even disregarding the sleeping schedule of his family. Tink was found in the harsh Western New York elements alone, and cold. The newest cat to the clan, has quickly become the popular favorite, with her sweet passive demeanor. This cat is truly thankful for all that has been given to her, making the most of her warm home, and plentiful food. She aligned herself with Bailey immediately forming the most devastating cat tag team I have ever personally witnessed. Tink also keeps her alliances with the humans in the house exchanging passive sweetness for a long and luxurious brushing. Tink by far, is the most popular cat in the household, earning her nighttime bed privileges. With all the positives she possesses her hindrance is her vile breath keeping all unwanted interactions at bay with a simple yawn. Her ultra soft coat, stunning eyes, and willingness to abandon cat behaviors to please humans, Tink is a fan favorite. junebug just called. sooo pissed she's not a cxnx cat.